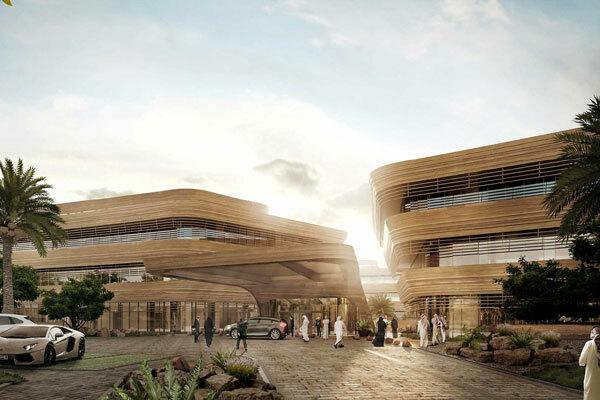 The hotel is inspired by the scenic and fertile Wadi Hanifa, a beautiful desert oasis running through Riyadh. The low-rise hotel resembles the smooth, dry canyon walls that make for a dramatic arrival experience. Once you step inside, the waterways guide the way into the heart of the building, ushering guests through the arrival court into the palm-dotted oasis in the heart of the hotel’s lush courtyard. Planted cacti, flowering vines, plentiful blooming desert flora and native date palm trees create a soothingly calming ambience, providing shaded secluded areas from the scorching desert sun. Here, life happens against a scenic lush backdrop in one of the restaurants and cafes. The complex is the first five-star full-service hotel in the Diplomatic Quarter and features 80 spacious modern rooms, and 140 fully equipped apartments. The deluxe rooms feature modern décor and ample workspace, allowing guests to stay connected with in-room technology including high-speed WiFi and bedside USB outlets. Guests staying in one of the six Premium Suites or the Presidential Suite can enrich their experience in the M Club Lounge offering an international buffet, hors d’oeuvre and local specialties 24 hours a day. Sparking brilliance through spaces that seamlessly blend work and play with state-of-the-art business facilities and innovative spaces such as The Greatroom, the hotel caters for the needs of both business and leisure travellers. Guests can enjoy an elevated experience through the Mobile Guest Services, delivered with the warm and professional service for which the brand is globally renowned. Riyadh Marriott Hotel Diplomatic Quarter houses three dining venues: Gojia Kitchen – a sophisticated all-day dining destination, a la carte restaurant Mesquite and Agave Café located in the lobby. The hotel offers multiple recreational areas surrounded by lush greenery. An open-air swimming pool serves as an ideal spot to unwind after a long day. Other facilities include 24-hour fitness centres for both men and women and a sublime Saray Spa featuring a Turkish Hammam and female and male treatment rooms. Meeting the highest standards for energy and environmental (LEED) Gold Certification requirements, the hotel site creates a protected micro-climate and maximises on environmental impacts. By amplifying useful daylight via a complex reflection process, the hotel can decrease its illumination needs during the day. Plentiful shaded areas and the building’s structure allow for natural ventilation, reducing the need for air conditioning and additional cooling.